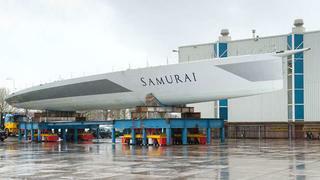 Royal Huisman is undertaking the conversion of 42m carbon composite offshore racer Mari Cha IV, which will be relaunched as Samurai. The yacht is being converted at Royal Huisman's Huisfit division in Vollenhove, The Netherlands, for an experienced yachtsmen who would like to add cruising amenities to the high-performance racer.William Bishop of Yachting Partners International assisted the client with the selection of the interior designer, the creation of the exterior concept design and the selection of the refit shipyard. Project management is by yacht consultant Jens Cornelsen. The epoxy carbon fiber structure will be modified to provide for the addition of a new deckhouse, superstructure and cockpits designed by Rhoades Young Design. The UK-based design firm is also taking extreme weight savings into consideration in the design of the bespoke interior, creating an liveable cruising interior where currently there is a barebones racing interior. Also in the realm of weight savings, lifting keel will replace her canting keel, and Samurai will sport easy-to-maintain faux teak decks. The yacht will also receive a full technical overhaul and upgrade of all on board systems, including high-speed hydraulics for the winches and new alarm, entertainment, monitoring and navigation systems. The Royal Huisman yard also stays busy with its new builds, including three yachts ranging in size from 40 to 52 metres. The recently launched 48m Royal Huisman superyacht Wisp is on track for her forthcoming delivery.